Goryeo (Koryo) ruled ancient Korea from 918 CE to 1392 CE. Goryeo (Koryo) ruled ancient Korea from 918 CE to 1392 CE. The kingdom oversaw an unprecedented flourishing in culture and arts with developments in architecture, ceramics, printing, and papermaking. The kingdom was repeatedly invaded by the Mongols in the 13th century CE and thereafter became less independent and more culturally influenced by their northern neighbours. Korean independence was re-established under the Joseon (Choson) dynasty from 1392 CE. Kuryo is the origin of modern Korea’s English name. The Unified Silla Kingdom (668- 935 CE) had held sway over the Korean peninsula for three centuries, but the state was in a slow decline. The rigidity of its class structure, based on the bone rank system, meant that few could rise above the position of their birth and ideas and innovation were stifled. The aristocracy began to resent the power of the king, landowners resisted centralised control, and the peasantry grew more and more rebellious over the incessant taxes levied upon them. The state was falling apart from within. The period of political turmoil which followed is referred to as the Later Three Kingdoms period (889-935). Gyeon Hwon (Kyon Hwon), a peasant leader, took advantage of the political unrest in 892 CE and formed a revival of the old Baekje kingdom in the south-west portion of the peninsula. Meanwhile, an aristocratic Buddhist monk leader, Gung Ye (Kungye), declared a new Goguryeo state in the north in 901 CE, known as Later Goguryeo. There then followed a power struggle for control of the peninsula. Kyon Hwon attacked Gyeongju, the Silla capital in 927 CE while Gung Ye’s unpopular and fanatical tyranny led to his death at the hands of his people. He was succeeded by his first minister, the able Wang Geon (Wang Kon), in 918 CE who attacked Later Baekje, now beset by leadership in-fighting, and then Silla. The last Silla king, Kyongsun, surrendered in 935 CE and left Wang Kon to unify the country once again but under a new name, Goryeo. Wang Kon was eager to rekindle the former glories of the Goguryeo (Koguryo) state, which had thrived during the Three Kingdoms period (37 BCE – 668 CE), and perhaps for this reason selected the northern city of Songdo (Modern Kaesong) as his new capital. Wang Kon declared himself king and for his contribution to creating the new state he was given the posthumous title of King Taejo or ‘Great Founder.’ However, Taejo’s kingdom was far from secure and the Khitan (Qidan) tribes in the north proved stubbornly resistant to Goryeo’s expansionist policies of the late 10th and early 11th century CE. Indeed, the Khitan counter-attacked twice and briefly took Songdo. A third battle in 1033 CE finally saw Goryeo victorious, and a defensive wall was built stretching right across the northern Korea border. This wall became especially useful when the Jin dynasty overran the old Khitan territories in the first quarter of the 12th century CE. The Goryeo system of government was much like previous Korean kingdoms with a centralised government presided over by a monarch who might consult a small council of senior administrators. The civil administration was dominated by an expanded but still exclusive aristocracy ruling over a largely peasant populace with some skilled artisans producing manufactured goods such as ceramics, weapons, and art objects. Intermediary between these two levels were local magistrates (often large estate owners with their own private army) whose authority could be all-powerful in the districts where the centralised government was absent (perhaps 60% of districts remained semi-independent). At the bottom of the social ladder were slaves (prisoners of war, debtors, and criminals) who worked on the estates of the landed gentry or for the government on building projects such as fortifications. There was very little social mobility as any positions of significance and even entrance exams to those positions were strictly limited to those of a particular status decided by one’s birth. Entrance to the state schools system (centralised in 992 CE) was also limited to those of a certain social rank. In Goryeo, the female line was often as important as the male line, which meant that women were treated more favourably than in contemporary cultures such as China. 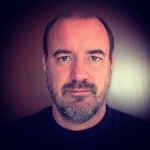 Sometimes a husband moved into his wife’s family home, women could divorce and keep custody of their children, and they could also inherit equally with their male siblings. One significant change from previous regimes was that Goryeo made slavery hereditary with a reform in 1037 CE; any child was to inherit the status of the mother. Many landowners took it upon themselves to expand the scope of this edict and classify as slaves any child born to a slave father too. This greatly increased the number of slaves so that they eventually rose to around 30% of the total population. Goryeo established close ties with China’s Song dynasty. The Song requested that Goryeo help them deal with the Khitan and Jin, but the Koreans were not keen to be embroiled in a wider regional conflict. Tribute was paid to China, but both state-sponsored and private trade included all manner of goods moving in both directions. China exported silk, books, spices, tea, medicine, and ceramics while Goryeo sent gold, silver, copper, ginseng, porcelain, pine nuts, and hanji paper. Other sources of foreign goods were Japan, which provided swords and folding fans, and Arab traders, who brought by ship such goods as spices and mercury. Such were the number of goods available that in the 13th century CE Songdo boasted over 1,000 shops. Cultural ties were also strong with Chinese literature being very popular, and the state administration modelled on the Chinese approach with a civil service examination introduced in 958 CE and Confucian principles followed. The state religion was Buddhism, which had been introduced from China centuries before and which continued to be endorsed by the king with many temples and monasteries being built. The Buddhist temple-monasteries, with their landed estates, royal patronage, and exemption from tax, became wealthy and the whole religious apparatus rivalled that of the state itself. Many such monasteries even had their own armed forces recruited from warrior-monks and the general populace. Buddhism was practised not only by the elite families, which often sent a son to study at a monastery and become a monk, but also by the lower classes too. One more example of the cultural ties with China is coinage. Korea had long used Chinese currency but began to mint its own coinage from 996 CE. 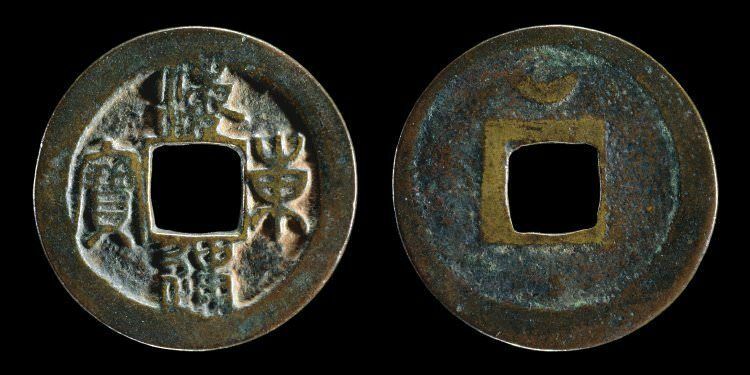 These coins imitated those of the earlier Chinese Tang dynasty (618 – 907 CE) and were made of iron and copper. Even the ‘heavy coin of the Qianyuan period’ inscription was translated from the Chinese Qianyuan zhongbao) to the Korean Konwonchungbo. The Goryeo mint did add an identifying mark such as ‘Eastern kingdom’ (Tongkuk) on the reverse side of their coins. As with Chinese coins, the Korean coins had a square central hole. An alternative to coins was the unbyong(aka hwalgu) silver vases which were made from 1101 CE. The vases took the shape of the Goryeo empire and were marked as legitimate currency by having the official state seal engraved on them. Buddhism was directly responsible for the development of printing for it was to spread Buddhist literature that woodblock printing improved and then movable metal type was invented in 1234 CE. Improved quality ink and hanji paper made from mulberry trees accompanied these developments, the latter gaining fame as the finest paper in the world. The period also saw an interest in documenting the history of the country with the famous Samguk sagi (‘History of the Three Kingdoms’) written in 1145 CE by Kim Pu-sik. Drawing extensively on earlier sources now lost, it is the single most important historical text on ancient Korea. Another Buddhist contribution to the arts is illuminated manuscripts. These sagyongare usually of texts from the sutras (sermons) attributed to Buddha and formed scrolls and folded books. 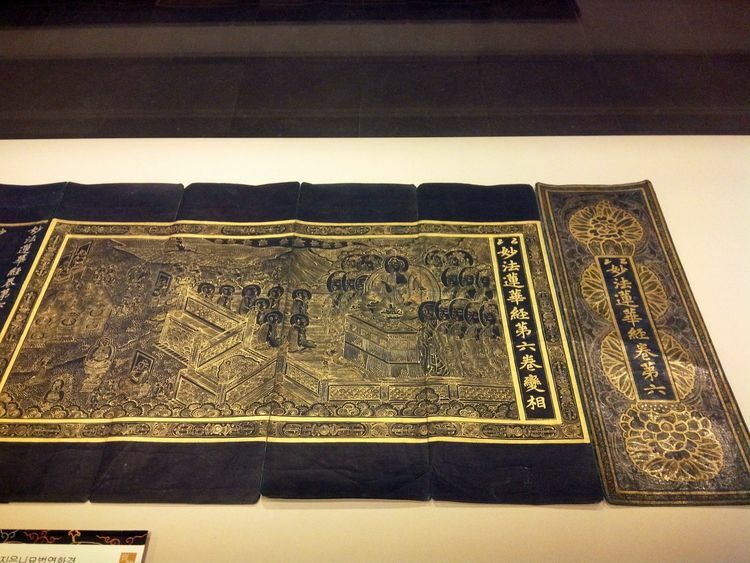 They were written by monk-scribes on indigo hanji paper using bright dyes and sometimes even silver and gold. 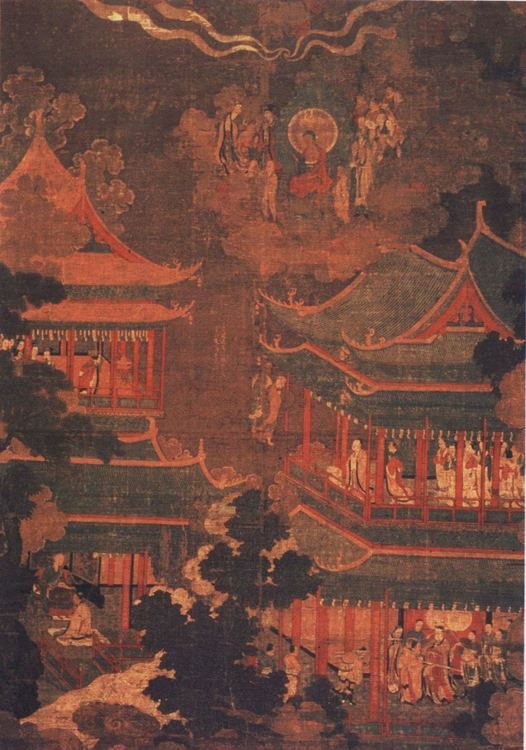 Buddhist monks also painted frescoes and silk wall hangings to decorate temples with bodhisattvas and water-flowers being the most popular subjects. Non-religious paintings of this period have not survived so well but were popular at the time, especially the specialised art form of fan-painting. It is known that painting was not merely done by professional artists but also as a hobby by those with the leisure time and means to pursue it. Goryeo’s sculptors used a variety of mediums including marble, stone, terracotta, and metal. Figures of Buddha as Maitreya (the coming Buddha) were popular and some are massive such as the 17.4 metre (57 ft.) high one at Paju and the 18.4 metre (59.3 ft.) tall figure at the Kwanchok temple in Nonsan which were both carved out of natural boulders in the 11th century CE. Many figures wear unique tall hats and this may represent a link with shamanism, long practised in ancient Korea. Standing figures of soldiers or officials were commonly placed in pairs outside tombs, as per the China model. In the second half of the period, sculptures are mostly small-scale and made with gilt-bronze. Another area of metalwork was the production of bells for Buddhist temples. Smaller than the giant bells made by the earlier Unified Silla kingdom, Goryeo bells can still be up to 1.7 metres tall and were cast in bronze and decorated with dragons and heavenly figures amongst others. One unique feature is the lotus medallion cast at the point where the bell was struck. Bells must not have been too popular with the local populace as they were often compelled by monasteries and temples to ‘donate’ bronze goods so that they could be melted down and recast. Handbells, temple gongs, incense burners, and vases were also cast in bronze and sometimes embellished with very fine silver and gold inlay. Goryeo potters produced unglazed stoneware and white porcelain, but their most celebrated creation is celadon ware. The latter, also known as greenware because of its pale green colour, has a smooth glaze and pieces typically have fine inlaid designs (sanggam), especially Buddhist motifs such as the lotus flower, cranes, and clouds. 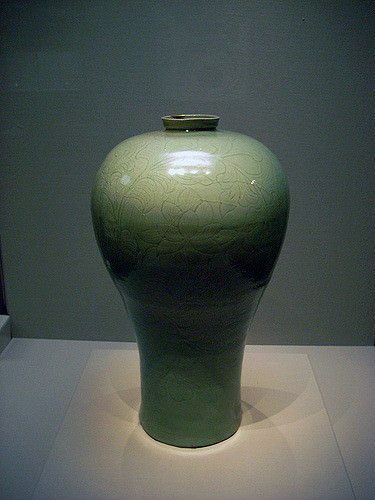 Celadons were first introduced into Korea from China during the 9th century CE, but Korean potters became so skilled at their manufacture that their wares were exported back to China and, even today, Korean celadons are amongst the most prized ceramics in the world. All manner of items were made from incense burners to ink stands to roof tiles, but the most quintessential shape is the tall elegant jar with bulbous neck known as a maebyeong. There are no surviving temples from the Goryeo dynasty, made as they were largely of wood, which is a poor archaeological survivor. A good idea of the architectural style is seen in the 13th-century CE Hall of Eternal Life (Muryangsujeon) at the Pusok temple in Yongju. 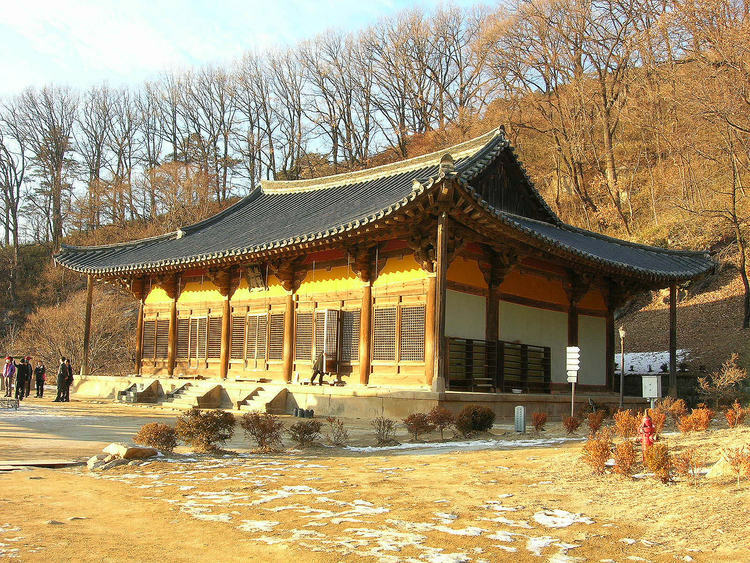 It is one of the oldest wooden structures surviving in the whole of Korea. Its roof displays a dual edge and is supported by three-tiered supports. It also has the more complex roof brackets at the top of supporting columns typical of the period. The wooden columns taper and permit ceilingless openwork. Stone pagodas have survived better, and these are eclectic depending on location. Stone lanterns are another indicator of Goryeo architectural design with many taking the form of pairs of lions, columns, or octagonal platforms. The best-preserved tomb from the Goryeo period, located near Kaesong, is that of king Kongmin (r. 1330-1374 CE) and his Mongolian wife Noguk. The two mounds of the tomb have stone balustrades with statues of tigers and sheep, which represent yin and yang. Within the mound are two stone chambers decorated with wall-paintings and constellations on the ceilings. 11th and 12th century CE tombs are also to be found at Kaesong and are similarly decorated, the animal zodiac occurring in several as it does in Kongmin’s tomb. Many Goryeo tombs contained slate coffins which were decorated with relief carvings of the four animals of the cardinal directions. The years of relative peace in the 12th and 13th centuries CE allowed for a flourishing of the arts, but it also resulted in a steadily increasing decadence among the ruling elite, corruption, and social unrest. A significant rebellion led by the king’s father-in-law Yi Chagyom in 1126 CE and another by the monk Myochong in 1135 CE were quashed, but matters came to a head in the reign of king Uijong (1147-1170 CE) who was much criticised for building lavish palaces and water parks. There were, too, conflicts between the various sects of Buddhism and claims the king favoured the Kyo sect over the others. The military, with not much else to do and no status in higher society, staged a coup in 1170 CE. Uijong was replaced by his brother Myeongjong, but he only remained as a puppet sovereign. Decades of turbulent in-fighting between all levels of Goryeo society ensued with more coups, assassinations, and slave rebellions. A new threat to Korea emerged in the early 13th century CE when the Mongol tribes, united by Genghis Khan (Chinggis), swept through China and conquered Beijing in 1215 CE. The crisis came in 1231 CE when the Mongols, now led by Ogedei Khan, invaded Korea, forcing Goryeo to move its capital to Kanghwa Island the following year. While the ruling elite was safely ensconced on their island, the rest of the Goryeo population had to face six Mongol invasions over the next three decades. By 1258 CE the people had had enough, and the military ruler was assassinated, the king reinstalled with full powers, and peace made with the Mongols. The price for the latter was an obligation to provide ships and materials for the (failed) Mongol invasions of Japan in 1274 and 1281 CE. Korea then became increasingly influenced by Mongol culture, princes were required to live as hostages in Beijing, and several kings married Mongolian princesses. 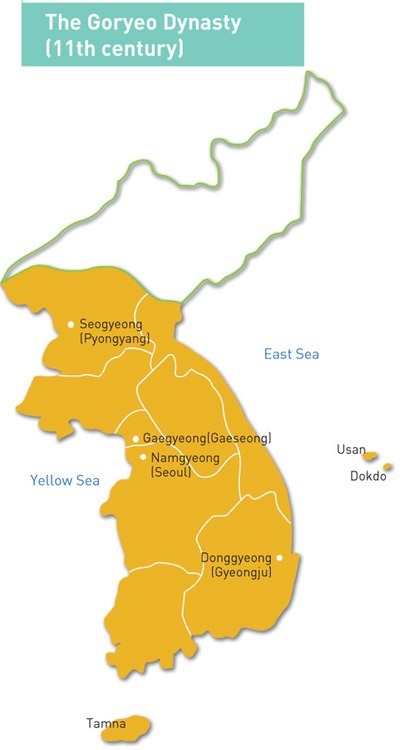 Korea would have to wait another century to re-establish its independence when, in 1392 CE, the general Yi Song-gye formed the new state of Joseon. Patricia Buckley Ebrey. Pre-Modern East Asia. (Cengage Learning, 2008). Originally published by the Ancient History Encyclopedia, 10.17.2016, under a Creative Commons: Attribution-NonCommercial-ShareAlike 3.0 Unported license. This entry was posted in Uncategorized and tagged Goryeo, History, Korea, Medieval, Middle Ages. Bookmark the permalink.